Not gonna lie, I wholeheartedly think Sandra Lee is a hot mess. Most of her recipes strip the fun out of cooking, replacing fresh ingredients and unique spices with prepackaged, frozen ingredients, all for the sake of saving time. Which I believe is reserved for getting drunk, based on the heavy emphasis on “cocktail time” in each and every one of her episodes. A group of us were watching her show Semi Homemade (aka Semi Disgusting) like a horror film – a friend turned to us all and said that she couldn’t get over how batshit crazy she seemed. Watching her show is like a car accident in slow-motion – from recipes for Kwanzaa cake to jello shots (Um, we need a recipe for jello shots? How old are we? ), Food Network Humor has a wide array of just the recipes and techniques that make me groan every time I see her trying to teach people how to cook. So with all of the vitriole above, and my straight up disgust with Sandra Lee, maybe I need to put down the haterade for a second in that her gingerbread recipe is damn good. I found the recipe in passing while getting together my list of Christmas goodies to bake, and to my horror, the one that seemed like some majesty was hers. With a few tweaks made by my expert baker of a sister, this recipe absolutely goes into the pantheon of keepers for all time. Given that there’s no shame in my game, I do have to give her (or, more likely, whatever peon employee of Food Network Test Kitchen who wrote the recipe) credit where credit is due. But I can’t forgive all transgressions as your Espresso Martini featured on the Today Show was like a cloyingly sweet White Russian in a martini glass. Plus, the chapter about you in Anthony Bourdain’s “Medium Raw” is truly cringeworthy. 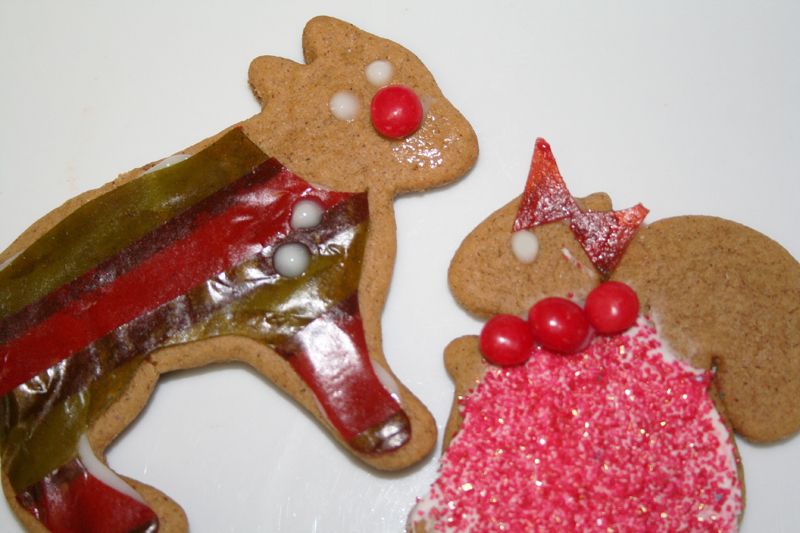 I guess I’ll just focus on the gingerbread and pretend to forget about your many other transgressions in the kitchen. And I’m Sandra Lee doesn’t care about any of us haters out there as she cashes those fat checks from her media empire and kicks back with myriad vodka tipples in the Governor’s mansion. Enough of the negativity – Lexi and I had a hell of a time decorating with the help of some strange Swedish animal shapes from IKEA cookie cutters and some well-placed decorative candy. We warmed Starburst with our hands and rolled it out like fondant to cut into ribbons and bows. We sliced red and green fruit roll ups into strips and pressed them together to make a Christmas striped sheet for cutting into scarves, sweaters and top hats. We used cinnamon candy dots to make necklaces and eyes. And rather than making royal icing from scratch, we used the prepackaged muffin glaze in a squeezable tube (found in the baking aisle at the supermarket) to stick on the decorations. I’m sure Sandra Lee would approve. In a standing mixer, blend the mix, egg, flour, butter, pumpkin pie spice, ground ginger, crystalized ginger, molasses, maple syrup, vanilla extract and almond extract. Once a dough forms, remove from the bowl, wrap with plastic and chill for about an hour. If you chill for longer than an hour, make sure to remove from the fridge about 15 minutes before you want to roll out the dough. Flour a board and rolling pin and roll out the dough to around 1/4 of an inch thick. Cut cookies with cookie cutters and place on a cookie sheet lined with parchment. Bake in a 350° oven for 7 minutes. Remove to a wire rack and let cool. Decorate as you see fit and store in a tupperware to keep soft and chewy.